Find best car rental deals and save money! 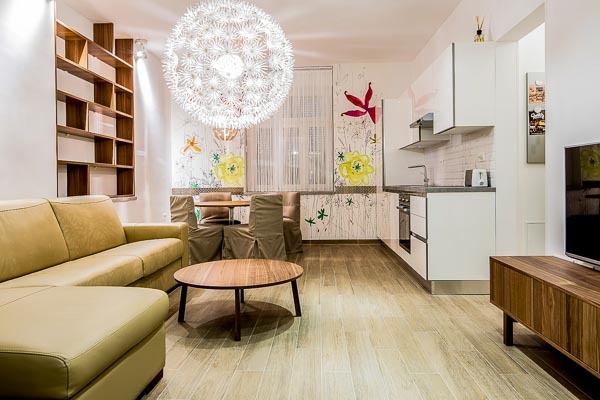 Newly renovated and furnished White House – Bela Hisa in Siska district of Ljubljana is a popular choice among group or single travelers who are visiting Slovenian capital city for different reasons. It is easily accessible from the highway ring, couple of minutes drive from the central Tivoli park and the city center. There are 4 twin-bed rooms (2 guests) and 8 apartments (4-5 guests), which are of various sizes and equipped to meet high international ecological standards. All units provide above the standard comfort, including free Wi-Fi internet, big screen TV and beds are of high quality. Washing machine and hairdryer are in all units. As apartments include a kitchen equipped with appliances, they are also appropriate for long-term rental. Two apartments have a room for a child, with a baby cot and a highchair. Four units are extended with private terraces and there is also a spacious rooftop garden on the first floor to enjoy. 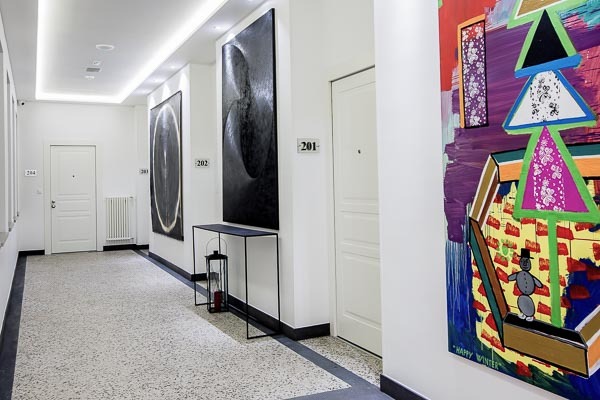 For connoisseurs of fine arts there are works of some of the prize-winning Slovenian artists in the hallways exhibited. White House may not be situated in the very centre of the city but is for that reason far more suitable for those who travel by car. It is easily accessible from the highway ring. As parking is free and available at any time, you do not have to worry about where to park your vehicle. There is less than 10-minute drive to the center of Ljubljana. To avoid searching for a parking place and paying for it, use public city bus (No. 1, 1B, 15, 25). You may also afford yourself a half an hour walk to contemplate non-touristic part of Ljubljana or use public bike share system. As White house is located by the ring some points of interest are easily accessible like BTC shopping area, Stozice Arena and Stadium (sports events, concerts), Tivoli park and Koseze lake (green getaways), Gospodarsko razstavisce (exhibition and congress center) or ZOO. The reception desk is available 24/7, as well as a vending machine with the basic selection of snacks and beverages, while breakfast arrangements are possible in the adjacent restaurant. Fresh potable water, coffee and hot beverages are available for free. Iron with ironing board is available on demand at the reception desk. In each room and apartment, you’ll find a map of the city with all the basic information you need to make the best of your visit of Ljubljana – do not forget to ask the staff for the latest tips!